The Piras Group consultants have been designing and facilitating team meetings for 20+ years. We partner with meeting leaders/organizers to develop key objectives for the meeting, build a strong yet flexible time-based agenda, design the activities and discussion methodologies to best support your desired outcomes, and determine the leader’s role in the meeting. We may also coach the meeting leaders on how to optimize their influence in the meeting. We understand that meetings are created for a multitude of reasons and different kinds of meetings necessitate different activities and styles of facilitation. These meetings generally involve the top leadership of the organization or sector and typically are for setting direction and goals. We might look at a one,two or five-year horizon. Strategic planning generally includes an assessment of the current business climate, clarification of your vision (ideal future) and values as well as your organization’s purpose and value to the company, identifying needed changes, and reviewing past successes and challenges. Strategic planning almost always includes building a plan to convert strategy to action and identifying the owners of those actions. Learn more about how The Piras Group facilitates the strategic planning process in the videos below. You can also read the series articles about this process starting with Why an Organization’s Vision is Even More Important Today. The need for team building can include jumpstarting new teams, accelerating the productivity of a team that is “stuck,” building team camaraderie and trust, providing team members an opportunity to learn more about one another through use of a style instrument (DiSC, Meyers Briggs, etc. ), and building teamwork among the members of a virtual or global team. Expert facilitation is necessary for these kinds of meetings. The Piras Group consultants are highly skilled in facilitating these kinds of team building and team growth meetings. Leaders at all levels need to prioritize tasks and allocate resources on a yearly basis, then monitor and align on those most critical to business success. More and more of these decisions are made by the team involved in the work, and that necessitates a well-facilitated meeting. Allowing the team leader or manager to participate in the process requires outside meeting facilitation. Plus, group decision-making is challenging and it takes a high level of facilitation skill to plan and carry out a successful meeting of this kind. The Piras Group consultants have been facilitating meetings of this kind for 20+years, all with successful outcomes. When a new leader comes onboard, he inherits a team or maybe she came from that same team. The new leader deserves the opportunity to get to know the team – and for the team to get to know her – in a safe, controlled environment. Team assimilation meetings serve that purpose. Generally lasting 3-4 hours, the team and the leader ask and answer a wide variety of self-generated questions and the team leader has the opportunity to share his vision and plan for team development. The facilitator typically works with the new leader ahead of time to clarify their goals for the meeting, prepare questions for the group, and discuss answers to questions that are likely to be generated. The facilitator also works with the team to help them generate their list of questions for the leader and sharing important information about the team. The majority of the time is spent with everyone together in the meeting itself, facilitated professionally so everyone involved can focus on the interaction. We invite you to learn more about our latest offering, the JumpStart Series, that provides a complete approach to New Leader Assimilation. 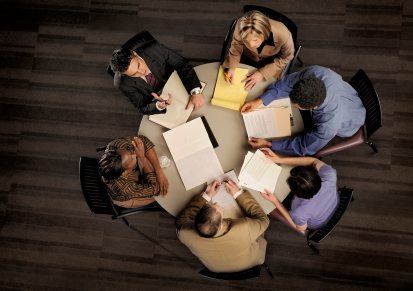 We invite you to call or email us to find out how we can help you with your key meetings.